Reedville Virginia fishing is in popular demand, not only by the residents and visitors who enjoy the sport, but by the area's economy, as well. The fishing industry in Reedville is what it's all about, and it's all centered around one fish - the Atlantic menhaden. This small, oily saltwater inhabitant comprises one of its largest populations right here in our bays. Its main commercial purpose is serving as a protein additive in foods. 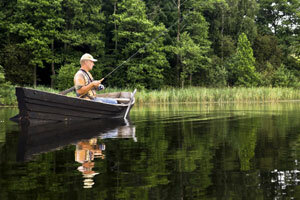 Those who appreciate the leisure side of fishing enjoy what Reedville's waters have to offer, as well. A fishing trip to the bays of Virginia is an unforgettable experience, and our Bay Motel Virginia can play a part in that happening. Most fishing excursions aren't about the accommodations, other nearby attractions, or fancy places that only distract you from the task at hand. When fisherman travel to fish, that's their number one focus, and the rest can fall into place. If this bears truth with you, our motel is just what you need - an affordable and conveniently located spot to rest your head. You'll be under our roof only for a short amount of time, because the waters will be calling you. Don't waste your money staying in a luxury hotel, where you won't even choose to enjoy any of the added amenities. The Bay Motel Virginia is just enough to impact your trip in a positive way, but no more where it'll change the dynamic. When you plan your next Reedville Virginia fishing getaway, be sure to reserve a room at the Bay Motel.